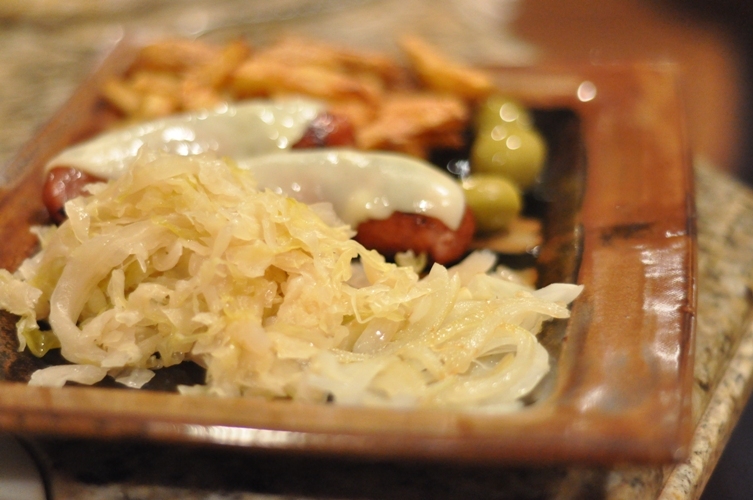 Last but not least for today…SAUERKRAUT. We started our first batch of sauerkraut on August 8th well doing our tomatoes and I forgot to post it. But, while skimming the foam on the first batch and occasionally sampling it we decided it is too tasty not to repeat. Use a crock or a large stainless steel pot. Layer thinly sliced cabbage and salt into the crock using a ratio of 3 tbsps of pickling salt for every 5 lbs of cabbage. We use a cerated knife for cutting the heads of cabbage. You can use your food processor but this may leave the pieces a lot shorter…think about how you would like the finished product and then decide. We slice 5lbs of cabbage at a time and pack into the crock. This allows the brine to form while we slice the next 5lbs. Wait 15 minutes between layers so that natural brine/water will form. The cabbage will naturally sweat creating liquid/brine ~ make sure this covers over all of the cabbage. 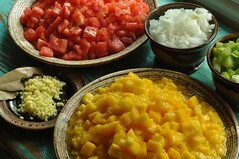 NOTE: if it does not make enough liquid create a salt water brine using 4 cups water to 4.5 teaspoons pickling salt. Bring to a boil dissolving salt and cool to room temperature before adding to the cabbage. Place an inverted plate on top of the cabbage with two 1 litre jars full of water to keep down, cover with a towel and place in a cool place. Skim foam, bloom, or scum daily. Keep between 70-75 degrees Farenheit. This process will take between 3-6 weeks (we’ve done 4 batches ~ all fermented for 6 weeks and a few we left a little longer). The sauerkraut/cabbage will still be crunchy at 6 weeks but may start to soften if left longer. Pack sauerkraut, with brine, into hot sterilized jars, leaving 1/2″ headspace (we sterilize our jars in the oven for 30 minutes at 250F). Remove air bubbles and adjust headspace, if necessary, by adding more brine. Wipe rims (using a damp paper towel), place lid and ring to finger tip tight on each jar and process 500mL (pint) jars for 20 minutes and 1L (quart) jars for 25 minutes in hot water bath. Turn off heat, remove lid and let stand for 5 minutes before removing jars. Check seal, label, and store. In a large stainless steel saucepan, bring sauerkraut, with brine, to a simmer over medium-high heat. Do not boil. With 15-25 lbs of cabbage this will probably have to be done in batches. Note: this is where sterilizing your jars in the oven will help free up an element on your stove so you can heat two batches at once and it will keep your jars hot. 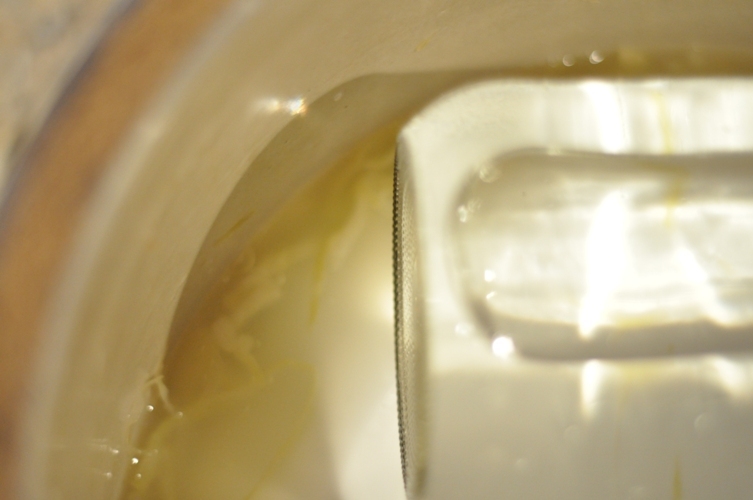 Hot-pack sauerkraut and brine into hot sterilized jars, leaving 1/2″ headspace. Remove air bubbles and adjust headspace, if necessary, by adding more brine. Wipe rims (using a damp paper towel), place lid and ring to finger tip tight on each jar and process 500mL (pint) jars for 10 minutes and 1L (quart) jars for 15 minutes in hot water bath. Turn off heat, remove lid and let stand for 5 minutes before removing jars. Check seal, label, and store. We have only used the hot-pack method and it seems to work well. 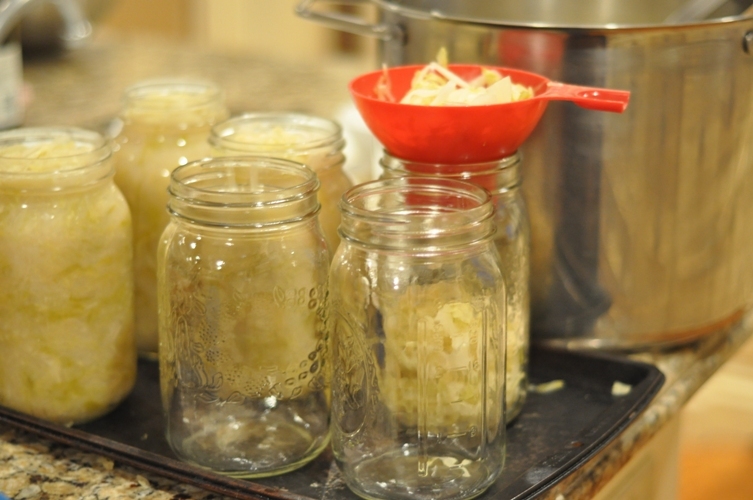 To prevent excessive air bubbles, we fill the jars by layering the sauerkraut and packing each layer down well. Pour liquid in at the half way point and again when your are almost at the top. You will get approximately 6 x 1L jars when you start with 20lbs of cabbage. Making sauerkraut is so much fun! It is a tasty experiment in the mysteries of fermentation, a process that was discovered by our ancestors hundreds of years ago. Enjoy your sauerkraut as a side, in a reuben sandwich, with sausages, or even in some homemade bread. Once you make your own you will never want to buy it again! So i started my first batch of kraut today…My cabbage was NOT juicy!!! I mixed it with the salt and waited and waited…but hardly any juice was made…Has this ever happened to you? I ended up making my own brine to cover the cabbage..Any thoughts? Not to worry. It has happened to us before. I’ve decided a few things. (1) You’ve got to pack the cabbage down as much as possible and wait 15 minutes or so between every 5lb layer. While waiting I cut up the next 5lbs. (2) The fresher the cabbage the more moisture it holds. As cabbage ages it dries out. Unless buying the cabbage directly from the farmer it is difficult to know how fresh they are. Making your own brine works just fine and the end result will be tangy, delicious tasting sauerkraut. Just make sure the cabbage is submerged under liquid. And, don’t worry too much about it. Some batches produce bloom (or scum) right away well others don’t until the 3rd or 4th week. Keep an eye on it and skim off the bloom as it forms…usually once a day once it starts. Good luck! Thanks! Great advice as always! So…its been 3 weeks and 2 days!!!! no scum…I go excited when i thought I saw some but it was just a piece of cabbage gone funky!…I also made a batch of turnip and a batch of beet kraut which aren’t doing a heck of alot either! Do i just taste it when its pushing 6 weeks and see if i like it? How do you know when its time to process it??? Hope your enjoying your trip!! Thanks again! You can start tasting it now. We taste it throughout the entire process. I love it after a day when it tastes like salty crisp cabbage and I really start enjoying it after about 3 weeks. I wouldn’t worry that there is no scum. Our winter batches rarely create the kind of bloom they do in the summer. As long as it is submerged in brine everything is good. Does it create bubbles when you push the plate down around the edges? You can leave it to ferment for quite a while (6 weeks is just a guideline). The longer you leave it the more sour it will become and a little softer. Go with the taste you enjoy! Mmmm, I’m kind of envious and miss my counter krauts. I love enjoying a small bowl every day right out of the crock. WOO HOO!!! I’m gonna taste it tommorrow! Very exciting! When i push the plate down there is bubbles..especially on the turnip kraut..Thanks for you help!! I’m into my 2nd week and have had to add more salt water because there was none covering the cabbage. Will that hurt it? There were a few bubbles on the surface a couple days ago but now nothing. However, it is starting to smell like kraut. Mostly concerned that the liquid had evaporated. No, adding more salt water will not hurt it. (the ratio is 4 cups water to 4.5 teaspoons pickling salt. Bring to a boil dissolving salt and cool to room temperature before adding to the cabbage) And, the bubbles can come and go. Sometimes pressing down on the plate will release a series of bubbles and sometimes batches just bubble on their own. I’ve found in the past that if your room temp. is too low (below 68F-70F) the liquid tends to disappear…not really sure why. So, we try to keep it at a steady room temp of about 70F or a little warmer (if possible). Also, every time we check it, remove the plate, and/or skim the bloom/scum, we press it down hard with a potato masher (compacting it releases the juice). Please let us know how you make out. It is a constant and interesting experiment and we love to hear how everyone is making out. All of our conditions vary slightly and from season to season. But, it is important to keep the cabbage submerged in the brine so that it ferments. No, it’s fine…we find some batches smell more than others and I think those are the ones that end up tasting the best (they seem to ferment better and the more bloom the better ~ it means it’s really doing it’s thing). We put a really heavy bath towel over ours to keep the smell in. Have you tasted it? So glad to hear (that you like it and that you’re hooked)! It’s addictive and better than any of the store bought stuff. We’re going to try fermenting rutabaga and cabbage together but it will have to wait until June. The whole fermentation process is so cool. Enjoy!! My Sauerkraut got canned this weekend and it is the best I’ve ever had (and my family is german and makes alot of kraut)! I did 10 pounds and got almost 5 quarts. My boyfriend is beyond pleased and I’m looking forward to trying my hand at kimchi next! Awesome!!! I love it when a plan comes together….now, you will never be able to go back to the store bought stuff!